If you play Resto Shaman and use Ancestral Protection Totem (AKA Ankh Totem), it can be annoying when someone has the ankh totem rez available, but they don’t take it because they simply didn’t notice it. This weak aura will pop up an alert on screen letting the person know they have the ankh totem rez available to take. This can be especially useful on progression bosses when Shamans are dropping the totem to rez someone mid fight on a part that someone in the raid tends to die, or even for tanks when they knowingly take an ankh totem death. We have all done it, we start that +10, +15 or +18 only to discover that you started the run without any mana food. And it can be pretty embarrassing to need to use mana potions instead of intellect or damage pots because you ran out of food. There is a secret trick you can use to create emergency mana food – or Sugar-Crusted Fish Feasts – on the fly in mythic plus, without having to be obvious that you are out of mana food. First you need to level up BFA cooking to a minimum of level 85. This can easily be done using mostly vendor items – and don’t forget you can now get cooking levels in Darkmoon Faire now. You need to learn the recipe for Seasoned Loins, which is a health and mana food. In you reagent bank, always keep at least a full stack of Stringy Loins and Foosaka. Now, you need to have one of the pets that doubles as a cooking fire. This includes Lil’ Ragnaros (from the Blizzard Store) or Pierre (crafted by engineers). For convenience, set your chosen pet as a favorite so it always appears near the top of your pet list. When you find yourself out of mana food, simply summon your cooking pet, then when you have a few seconds to spare, you can quickly cook up some food on the fly. You can also cook in combat, so you can cook when the group is stabilized and not needing healing. Why Does the Auction House Mount Not Have Mana Food? When you spend 5 million gold on an auction house mount, you would think it would come equipped with everything you need in game to survive. But for some reason, while Merchant Maku offers a wide variety of food that restores health, you cannot purchase vendor food that restores mana, such as Rockskip Mineral Water. We didn’t see it added with 8.1.5, so there is hope we might see it with the Rise of Azshara content patch 8.2. The ability for healers to grab mana food off a vendor mount when not an an innkeeper or when there isn’t a mage available is annoying.
.@WatcherDev @WarcraftDevs Can we get some healer love by adding some mana food/drink to the long boi mount vendors? For 5m gold, I should be able to indulge in all my mana needs from Merchant Maku (especially for those oh crap, I'm out of mana food moments). If you are a tank and needs to die quickly, such as when you are trying to die within a certain time period using Ancestral Protection Totem (AKA Ankh Totem), having a quick cancel aura macro to instantly remove all healing hots can make a tank death occur much quicker, and without any healing proc RNG. 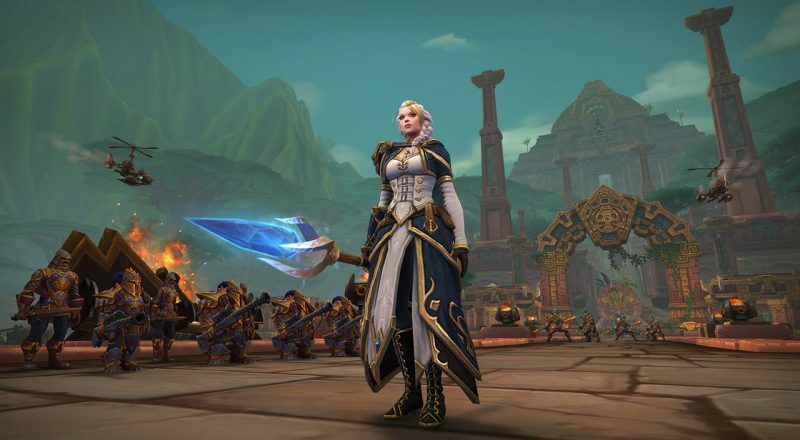 Using this type of macro is a great strat on Mythic Jaina in Battle of Dazar’alor. Here is a simple cancel aura macro for tanks to use that covers all healing hots as well as trinkets. Select based on your healer comp (otherwise the macro will be too long, or you can split it into multiple macros. Paste it into a macro slot. Tanks can also remove weapons to lower health. And Tanks should also /sit so they get critted. If you aren’t in the Warlords of Draenor Alpha/Beta yet and haven’t made a pre-made 100, the animation for the new Condensation Totem is definitely eyecatching. We will also be adding new videos for new spells and animations for all the healer classes, so be sure to subscribe to our YouTube channel too!